Are pigeons nesting under your solar panels? Are you in need of pigeon removal from your solar panels? Well Gold Coast Pest Management Solutions are the experts in the removal and prevention of pigeons under your solar panels. Pigeons are a very common pest no matter which city you are in throughout QLD. Often times pigeons will be attracted to the highest point of a building or strutcure in view. If that structure so happens to provide adequate shelter, pigeons will use that location to then nest and often times Gold Coast Pest Management Solutions are called upon to remove the pigeons from under the solar panels on roof tops throughout the Gold Coast and Brisbane Suburbs. Often times when the experts from Gold Coast Pest Management Solutions inspect a roof top for pigeon activity, we find evidence of failed attempts to control the pigeons or prevent pigeon activity which is normally attempted by an inexperienced pest controller or home owner. Gold Coast Pest Management Solutions have been providing effective pigeon control and sealing up/pigen proofing of solar panels for pigeon activity for many years and are well experienced in the intsallation of a professional pigeon prevention system to ensure all pigeons are removed from under the solar panels and the solar panels are adequately sealed to prevent re-infestation. Gold Coast Pest Management Solutions are so confident in the pigeon proofing of the solar panels that we offer a 3 year warranty, and on-going warranty when an annual inspection is completed at the end of the 3 year period. If you are hearing pigeons on your roof top don’t rely on a DIY product or an inexperienced pest controller to attempt to solve your issue, as climbing on roof tops can be very dangerous and pigeons are not a quick fix. Gold Coast Pest Management Solutions are licensed for Working at Heights Safely and well experienced to implement what ever methods are needed to solve your pigeon control issue. The photos above are professional pigeon control proofing photos implemented by Gold Coast Pest Management Solutions that suit any style roof. Call the experts today! Rat and Mice infest Southport home causing damage in roofs! Normally the colder weather tends to bring lots of rats, mice and possums inside the roof space of homes where they are provided with extra warmth, but Gold Coast Pest Management Solutions have been inundated with high numbers of calls for rats and mice since the warm weather has hit the Gold Coast area. Gold Coast Pest Management Solutions were recently called to a Southport home on the Gold Coast where the occupants were being kept awake throughout the night by excessive sounds through the walls and roof on both levels of the home. Gold Coast Pest Management Solutions provided a professional pest inspection and upon inspecting the roof there was clear evidence of excessive rodent droppings in every square inch on the roof space. Not only had the property been sverly infested by rats, but the rats were even starting to gnaw at the air-conditioning unit. Luckily gold Coast Pets Management Solutions were quick to provide a professional rodent pest control treatment to eradicate the current pest issue. Gold Coast Pest Management Solutions are experts when it comes to ivestigating the sounds in your roof caused by pests. Gold Coast Pest Management Solutions are licenesed possum controllers and have been provideing Gold Coast homes with fast and reliable possum removal, rodent control, and rat and mice pest control services for over 8 years. If you are one of the Gold Coast’s locals being kept awake all night by pest’s in your roof, call the experts in Gold Coast Pest Control and Pest removal! Termites are one of the more serious pests that can cause extenisve and expensive damage with unwanted stress. When termites decided to eat out a commercial business located on the Tweed they not only cause the finanical stress of repairs, but they cause the business to shut down and under go extensive repairs. Temites will infestt any property weather you have a steel framed property, solid brick or concrete or a unit on the 5th floor. The termite infestation found by Gold Coast Pest Management in Tweed was a commercial business with soild concrete walls (Tilt panels) and for any experienced termite controller the area termites will normally gain access on this type of building is the silcone between the joins of the concrete tilt panels. Although the walls are concrete, a business operatimg inside these concrete walls will normally have timber dividing walls, flooring for upstairs room and bathrooms and the termites will eat through the silicon in-between the concrete tilt panels and travel their way up untill they pop out and find a suitabel water or food source. This client was forced to shut down business and pretty much gut the insides out to just the concrete floors and walls due to the extent of the termite infestation. 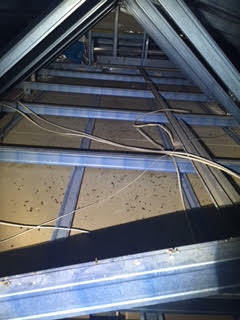 Gold Coast Pest Management Solutions carried out a termite eradication treatment and installed a termte protection system to prevent the termites gaining access inside the building. 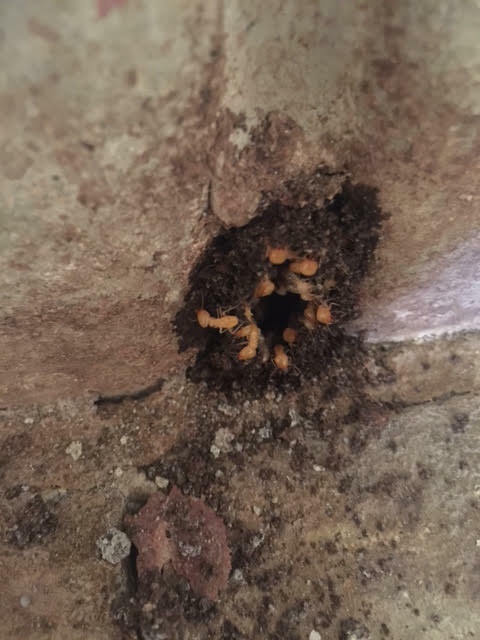 As you can see by the photos you will see the silicone has been eating out and the soldier termites are standing guard of the termite mud leads exposed by Gold Coast Pest Management Solutions. this was the last feed for these little nasties! No matter your loctaion or typr of property, you are susceptible to termite attack and it is in your best interest to invest in a Gold Coast Pest Management Solutions termite inspection. You will then be aware of if your property is under threat from termites and what termite control measures must be taken to reduce the likelyhood of your property being attacked. The presence of Red back spiders is defintely something that Gold Coast Pest Management Solutions finds highly established in many estates on the Gold Coast such as Upper Coomera, Pacific Pines & Coomera. Gold Coast Pest Management Solutions were called to assist an Upper Coomera client with a Red Back spider issue. Red Back spiders like to have low lying webs and are usually found at the bottom of piers, timber fencing and retaining walls, landscape drainge, roof voids and also outdoor furniture & children’s playgrounds where they can provide a very nasty bite causeing servere illness and irraitation to any victim. The need for regulary external pest control sprays can definitely assist in eradicating Red Back spiders form your property and keeping your family safe. Summer time brings the warm weather where every body likes to head outside with the family for some relaxation & activities which can increase the risk of your family coming in contact with many pest’s on the Gold Coast including Red Back spiders. Gold Coast Pest Management Solutions carried out a pest control on this Upper Coomera property located on the Gold Coast and once the external pest control spray was completed numerous spiders came out of hiding and Gold Coast Pest Management Solutions were able to capture a few good photos of the large Red-backs. Keep your family safe and ensure your pest control is up to date. Our genral pest control treatmemt will cover you for all your genral pest issues such as ants, cockroach & spiders, for an affordable investment your house hold will be pest free and you will be able to enjoy your summer out door activities with no nasty suprises and hospital visits. Gold Coast Pest Management Solutions have been servicing the Gold Coast for pest control & termite control for over 8 years and are experts in locating and eradicating pests with safe and affordable pest treatments. Call & book your next pest control service today! Q: The noise in our roof is so loud! Its to loud to be a tiny mouse or rat and it must be a possum – A: Rats & mice although very small can be extermely loud. Rodents such as mice and rats are more destructive then possums and will regularily gnaw and tear at air-conditionung ducts, insulation and wiring and will often use the material they tear to build a nest. Aswell as the destructive behaviour they will run & jump under the insulation in the roof which means you will hear this tampering on the back of your ceiling sheet which can explain the loud and clear sound often thought to be a possum. Gold Coast Pest Management Solutions have actually recorded footage of a family of rats working together to roll an apple across the back of a ceiling sheet down a wall cavity. All this activity is extrememly loud and is often the blame for a pesky possum. Q: How do the get inside or in my roof ?- A: Rats and mice are very agile and can easily scale a brick wall including rendered walls to access your roof. Once they are on your roof there are many areas such as joins and gutters they can enter. A rat or mice only needs a gap as big as their nose to fit through, which is roughly a gap the size of the end of a pen or texter. Q: What do we do if it is a possum in our roof? – A: Gold Coast Pest Management Solutions are licensed and experienced in possum removal and possum control and will detec if the noise in your roof is that from a possum or a rodent. If evidence of possum activity is found, Gold Coast Pest Management Solutions will provide an effective possum trap & relocation service with a quotation on sealing up an entry points to prevent any future possums from entering your roof. Q: Once you carry out a rat or mice pest control service where will they die in my roof and walls? A: There is no telling where the rodent will die. The old story that the rat will go in search of water and die outside is a regular myth told by old school pest controllers to keep the client happy. Once the rat or mice eats the rat bait it can take 3-5 days before the rodent dies depending on what method of control is used. If the rat or mouse dies inside the building and a foul odour can be smelt, Gold Coast Pest Management Solutions can provide a odour removal service where we not only attempt to locate & remove the dead animal but we install a specialised bag that is made especially for carcasses and urine odours which will remove any nasty odours within 24 hours. Q: Once the rodent pest control treatment is carried out will the rat or mouse go in search of water and chew through my water pipes? – A: The treatment implememted for rat or mice control does not make the rodent chew your pipes. Rodents regularily have to gnaw on objects to stop their teeth from growing to much and will chew on objects in your building no matter if a pest control treatment is implemented or not. The best thing to do is implement an effective pest control program to ensure no more destrution is caused. Q: How long will it take for the sounds in my roof and walls to stop – A: This depends on how quick the rat or mouse takes to the bait. Usually you will find the sounds will begin to cease around a week after the treatment is applied. Although Gold Coast Pest Management Solutions will recommended to allow 3-4 weeks before contacting us regarding the sounds as rats & mice are neophobic, which means they are affraid of new objects in their surroundigs and may take a few days or week before they decide to go near the rodent boxes or traps. Once they eat the bait it may take a period of 5 -7 days before they die. Q: Is it safe for my family & pets? – A: Gold Coast Pest Management Solutions have been carrying out pest control for the Gold Coast for almost 10 years now and have never had one issue, over this period we have regularily applied pest control treatments for clients who have severe sensitivity to chemicals and also have had pets that are sensitive to chemicals. Obviously alot of products used are a poison, and a poison is not safe for human or animal consumption, but it is they way the treatmemt is applied that ensures complete safety to your family and pets. Gold Coast Pest Management Solutions are up to date with the industries leading products and methods to enusre that all pest control treatments applied are applied in the most safest and effective way possible and this is why we have never had one issue in a decade. Are you hearing sounds and scratching in your roof? How do you know if you have possums, rats or mice in your roof and walls? Contact Gold Coast Pest Management Solutions today to ensure your rat. mouse or possum issue is resloved and your family and pets are safe from unexperiened or un-licensed pest control operators. Gold Coast Pest Management Solutions are experts in the control and removal of birds such as pigeons. Gold Coast Pest Management Solutions are licensed and permited for a number of pigeon pest control solutions including pigeon trapping, pigeon baiting and removal of pigeons with the use of firearms to allow for a fas and effective pigeon eradication treatment. If your building is infested by pigeons you are in need of a professional and experienced pigeon pest controller. If left untreated or left in the hands of an un-experienced bird controller, the pest issue you are experiencing will continue to increase. When pigeons infest a structure they also bring additional pest such as bird mites and bacterias detremental to humans such as Salmonella and Ecoli along with further and numerous bacterias. Gold Coast Pest Management Solutions service the Ipswich suburbs for pigeon pest control and have carried out numerous effective pigeon removal programs from Northern NSW to the North side of Brisbane and Western suburbs such as Ipswich. Our clients range from commercial & doemstic buildings, body corporates, shopping centres, horse stables, fuel sites, industrial factories. Marinas to domestic homes. If you are looking for a final solution for your pigeon issue do not look any further as Gold Coast Pest Management Solutions are well recognised for their effectiviness and know how in pigeon control and can provide a complete eradication program to a site clean up to break down and sanitise nasty bacterias that harbour form pigeons.